The school offers an extended day for children of working parents (for an additional fee) from 3:30 p.m. to 6:30 p.m. Monday through Thursday and one hour following dismissal on Friday. This program provides a warm, nurturing safe environment where children benefit from a nutritious snack, supervised homework, games, sports and recreational activities. The school maintains a zero tolerance policy against any form of bullying. This includes verbal abuse, physical abuse, written messages or cyber-bullying. Upon report and confirmation of an allegation, successive steps of interventions will begin. These interventions will include conferences with child and/or parent by an administrator or the guidance counselor, suspension and eventual expulsion from school. We seek your cooperation in impressing upon your children the importance of attending school regularly and "being on time." We ask you to please avoid scheduling appointments for your child during school hours. In the event that such an appointment need be scheduled, please send a note with your child on the day of the appointment. Parents must pick up their child before 2:45 p.m. Parents who pick up their children early must come to the second floor office in order to sign the child out. Children who are absent from school must present a note explaining their absence, to the homeroom teacher on the day of their return to school. To avoid gaps in learning during absence, arrange with a classmate to bring home assignments and needed books. Students who arrive past 8:00 a.m. must sign in. We are sure that you realize that the success of our school program is impaired by excessive and unnecessary interruptions. We urge that you help your child develop a good record of attendance and punctuality. In School Birthday Celebrations - Teachers of kindergarten and first grade arrange a monthly birthday celebration for all of the students whose birthdays occur during the month. Parents are usually contacted and asked to supply a portion of the items necessary for the celebration. No other birthday parties are held in school. All students’ birthdays are acknowledged on a daily basis with the presentation of birthday ribbons at morning minyan. Outside Birthday Celebrations - Parents who plan birthday parties which involve our students should adhere to the laws of Kashrut. Such parties should not be held on Shabbat or Jewish holidays. Invitations should be mailed, except when all students of a class are invited. Inculcating respect for the school and school property (building, desks, textbooks) is part of educational program, and we enlist the aid of parents in emphasizing these values to their children. Please help us in preserving the cleanliness and decor of our building. Cell phones/electronic devices may serve as an outstanding instructional tool and learning resource if used appropriately. We also understand that parents want to be able to communicate with their children in case of an emergency. However, those devices have become tremendous distractions for the learning environment of the school and have been used inappropriately in school (cyber bullying, texting, making phone calls, taking pictures of students and teachers, playing games during instruction). Additionally, over the years, students have increasingly been refusing to abide by the liberal cell phone/electronic device policy that presently exist in our school. It is therefore necessary for us to address the problem by developing a clear cell phone/electronic device policy for SSSQ. Parents must recognize that unless we deal with the problem, we will have difficulty in providing the organization and order necessary for a safe school climate and a good classroom environment. The cell phone/electronic device policy listed below has been approved by the school’s Board of Trustees and the PTA. 1. Students may have cell phones/electronic devices in school, but they must be turned off from the time they arrive at school until dismissal at 3:20 PM and must be kept completely out of sight. Cell phones may not be carried in students’ pants pockets, jackets, or placed in their desks. They must be stored in their locker or in their book bag. Cell phones may not be used during recess or lunch period. 2. Cell phones/electronic devices may only be used for educational purposes in the classroom setting and with the permission of the teacher. 3. Students may turn on their cell phones/electronic devices only when they are at their dismissal location. They may not be used while walking in the hallways or staircases when walking to the dismissal area. 4. In the event of an emergency, students will be given authorization by a teacher to use their cell phone. 5. Parents who may need to communicate an important message to their children during the hours of 8:00 AM and 3:20 PM should call the main office. If students need to contact a parent for an important reason, they should go to the main office and ask a secretary to call home for them. 6. Should a cell phone ring, vibrate or be used for any reason during the school day without teacher permission, or is visible anytime during the school day, it will be confiscated and given to an administrator. 6.1 If it is the first time the cell phone has been confiscated, it will be returned to the student at the end of the day. 6.2 If it is the second time the cell phone has been confiscated, a parent will be notified and the device will be returned at the end of the school day. 6.3 If it is the third time, a parent will be contacted and will be required to come to school to get the device. It will only be returned to a parent or responsible adult. 6.4 The fourth offense will result in after school detention and the student will lose the privilege of bringing the device to school for one month. 6.5 Continued infractions of the cell phone/electronic device policy may result in school suspension. 6.6 Refusal to surrender a cell phone/electronic device when asked, may result in any of the following disciplinary consequences: after school detention or suspension. We appreciate your understanding of this policy and ask for your cooperation. Please review the cell phone/electronic device policy with your children so that they understand it. Non-compliance with these guidelines will be taken seriously. The school choir is directed by our music teacher. It is open to children in grades 4-8 by audition. The choir meets once a week for rehearsals. They perform al various school and community functions during the school year. Children in the choir must have a white collared shirt or turtle neck shirt and navy skirt (girls) or navy pants (boys). At any time during a child's attendance at Schechter, continued admission can be denied due to academic or behavioral concerns or due to a family's failure to cooperate with school policies. As a school, we are committed to working with the whole child. We understand that matching a child to the appropriate school can be a complicated undertaking. Therefore, after admitting your child, we monitor his/her academic and social progress carefully. Administrators and other professionals work with your child's teachers to make sure that we can continue to meet your child's needs. Sometimes, we cannot. If this is the case because of an academic or behavioral concern, the school will make timely contact with you so that you can make appropriate arrangements for the following year. Rules and regulations are established in any institution to indicate the limits of acceptable social behavior. 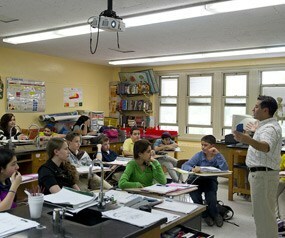 Discipline in the school is a prerequisite to the creation of an effective learning atmosphere. 1. A child may be referred to one of the principals. Records of such referrals are kept. 2. Parents may receive notification of persistent problems and may be required to attend a conference. 3. Guidance services may be sought. When this is deemed necessary parental approval is sought. 4. Referral for outside testing or counseling: In some cases if a behavior persists, the administration may recommend that the child be referred to an outside facility for diagnostic testing and follow-up. 5. Removal from class or suspension from school: When unacceptable behavior persists, or on those occasions when a child commits an act which endangers the health and safety of other children (e.g. fighting), or a member of the faculty or destroys school property, it may become necessary to suspend the child from school. If a student's behavior results in a second suspension the same academic year, the suspension shall be for multiple days. If a third incident occurs, a guidance hearing will be held which will include the parents of the child, a member of the administrative staff and the Vice President of Education for consideration of expulsion from the school. The Board of Education of our school adopted the following dress code for grades K-8. Most schools have found that children who are appropriately dressed and groomed have a more wholesome attitude towards school, and do better academically. The underlying rationale for the Dress Code is that dignity and propriety are called for in the children=s house of learning and house of prayer. Solomon Schechter’s dress code stresses a comfortable, clean, and neat appearance. Students are required to adhere to the dress code during the school year. We request your cooperation in helping us implement the school’s dress code. Kippot (no baseball caps) are required for all men and boys at all times while in the building. Hats or other non-kippot head covers may only be worn outdoors. Shirts - All shirts must have collars and sleeves, and cover midriff. The shirts may not have decorations, symbols, or slogans on them. Skirts, Dresses - must be minimally knee-length. Pants - Solid navy, khaki, tan, beige, black. Shoes - Shoes and sneakers must be flat and have a back. Sandals are fine as long as they have a back strap. Periodically students at Solomon Schechter will have “Dress-Down Days”. “Dress-Down Days” will be announced in our Thursday Notes, or via email. Students may come to school in clothing of their choice, but modesty and good judgment must prevail. Clothing that is not permitted on “Dress-Down Days” includes tank tops, spaghetti straps, tee shirts with offensive slogans, shorts, sweat pants, athletic wear, pants that could be considered pajama pants and shirts that do not cover the midriff. Students in grades 3-8 are required to wear a school physical education tee shirt which will be provided by the school. Students who lose the tee shirt will be required to purchase another school tee shirt at the cost of $10.00. Students in all grades are required to wear gym shoes for physical education. 1. Testing - Standardized achievement tests are given annually to students in grades 2-8. Additional tests required by the State Education Department and the New York City Department of Education are given also at the appropriate times. Parents recieve notification of test dates as well as results of the tests in school mailings. If needed, conferences are scheduled to discuss the results. The school maintains a list of professionals in the areas of psychological and educational testing and therapy. If you would like such information, you may call one of the school administrators or the school psychologist. If your child is evaluated by an outside professional, it is important for the school to have this information. A parent must request that a report be sent to the school in care of the Headmaster. 2. Psychological Assessment - During the Spring, a psychological assessment is administered by a licensed certified school psychologist to all students entering first grade, or students new to our school. There is a nominal fee for this service. The school offers a number of after school clubs for students of all grades for a nominal fee. Participation in clubs is optional. A notice is sent home at the beginning of October, and January, listing all clubs offered for each term. The child may be enrolled when payment and parental permission is received. Each club term consists of approximately ten sessions, which begin at 3:30 p.m., and end at 4:30p.m. On short Fridays clubs begin at 1:30p.m. and end a 2:30 p.m. The parent must provide all transportation for after school clubs. Children coming to school are assumed to be healthy enough to attend the full day's program, including recess and physical education. If a child becomes ill or injured in school, parents will be notified if considered necessary by the school nurse or school administrator. In case a parent is not available the designated emergency contact person will be called. When you are asked to pick up your child, please respect the judgment of the nurse in these situations. The request to take home a child due to illness or injury is motivated by wanting to do what is best for the child and for his/her classmates. Please make sure that the medical records and emergency information on file in the school are kept up to date. Before a child is enrolled at SSSQ, the parent(s) must provide documentation of their child's immunizations and physical examination on the medical form provided in the registration packet. These forms must be completed and signed by a physician before your child begins attending our school. The health immunization form must be updated by the physician and given to the nurse as a child receives new immunizations. As a rule, the only individuals according to New York State law who may administer medication to a student is a school nurse or administrator. Students are never permitted to administer their own medication without supervision by the nurse or administrator. If your child requires medication at school you must inform the school in writing and submit an authorization form signed by a physician and provide the medicine to the school nurse. If the nurse is not available, please leave the medicine and authorization form with an administrator. All medication must be stored out of the reach of children. Do not leave any medication in your child's lunchbox, in the classroom, or with the teacher. 5. You may ask your pharmacist to put half of the prescription in one bottle and half in another so that you can leave one bottle at school. Both bottles must be fully labeled by the pharmacist. 6. All medication administered by the authorized staff at SSSQ will be documented in writing at the time of administration of medicine, including: date, time, dosage and observation of any side effects. Parents will be notified by phone if side effects are noted. This information is noted in our Medication Log and kept in the nurse's office. 7. If needed, remember to take the medication home at the end of the day. 8. We return all medication to the parent when no longer prescribed or needed. 9. Over-the-counter-medication - If a child develops symptoms which indicate a need for over-the-counter medication, including topical ointments, while in school, such medication may be given under verbal instructions from the parent for that day only. If a child requires over-the-counter medication beyond one day, the parent must send written instructions to the school nurse along with a physician authorization form. Parents of children who frequently or regularly require administration of over-the-counter medications (i.e. Advil, Tylenol, Pepto-Bismol, Benadryl, etc.) must submit an authorization form signed by a physician and provide the nurse with the medications. When a child contracts a contagious illness such as strep throat, unexplained rash, pink eye, chicken pox, etc., the school must be notified at once. As appropriate, this information, without identifying the child, may be shared with parents of other children. Students with strep throat may not return to school until 24 hours have passed in between the day that an antibiotic was started and the day of return. For example, if a child began antibiotics on Monday morning and is otherwise symptom free, s/he should nonetheless remain home Tuesday and not return until at least Wednesday. Children who have the above illnesses may not return to school until they are medically treated and cleared by a physician to return to school. All temporary illnesses require a 24 hour period without symptoms or symptom relieving medication. Determining whether or not a child is too ill to remain in school is often a judgment call on the part of the nurse. Parents will be contacted if a child exhibits fever of 100.4 degrees or higher, head lice, continuous coughing, vomiting or other overt symptom. Once notified, parents must make arrangements to pick up their child immediately. If your child has a fever of 100.4 degrees or higher s/he needs to be excluded from school until s/he has been fever free for 24 hours. A child attending our Shorashim or Pre-Kindergarten program may not begin their day with a temperature greater than 99.9 because fevers are typically at their lowest in the morning and rise during the day. This temperature needs to be measured without fever-reduction medication. Children may not return mid-day of the following day if they have been sent home with an illness. We ask that in the case of illness, even a virus or a cold, parents be conservative about returning their child to school. Unfortunately, too often students come back and present a further risk to both students and staff. If a child has an allergy that the school needs to be aware of and/or to monitor, it is the parents' responsibility to alert the school in careful detail to the nature and severity of the allergy and the steps that the school personnel may be required to take to manage a reaction. This information should be listed on the medical information form submitted at the beginning of the school year. In case of a life-threatening allergy a Food Allergy Action Plan must be completed by the child's physician and updated yearly and submitted to the school nurse along with all necessary medications. This form can be obtained from the school nurse. Children who have asthma must have an Asthma Action Plan form on file in the school. The form must be filled out by the child's physician and given to the school nurse along with all necessary medications. This form is available in the nurse's office. The school nurse conducts periodic head lice checks on children's hair. In accordance with New York City public school procedures, any child with live head lice or nits (lice eggs) will be asked to leave school until all lice/nits have been removed. Parents will be notified and advised on how to perform the necessary head wash at home, and the nurse will monitor until all lice/nits have been successfully removed. The Health Insurance Portability and Accountability Act (HIPAA) instituted national requirements for ensuring the privacy of all identifiable data related to an individual's health status. This was intended to ensure that personal medical information is shared responsibly and to protect client confidentiality. Information can be shared between the child's health care provider and the school nurse, as long as the child is under the care of the school nurse, without violating this act. Significant health conditions of any student will be disclosed to school personnel in contact with that particular student in the case of an emergency. This information is shared so staff members will know how to respond appropriately until the school nurse arrives. It is our policy to assign homework in all grades, as necessary. The purpose of homework is to provide an opportunity for students to show that that they are able to apply the skills they have acquired in school while working independently reinforcing the skills and concepts learned in class. At no time do teachers or the school intend to overburden students. If you believe your child has an excessive amount of homework, or requires excessive help from you, please bring this to the attention of the teacher. Parents are requested to provide an atmosphere conducive to studying for their child and to assist him/her in planning homework time properly. Parents play a crucial role in helping their children to develop good study habits. Parents should let their children know they expect homework to be complete, neat and finished in a timely manner. If a child is absent, it is the child's responsibility to get assignments from the teacher or a classmate. We ask the cooperation of parents in keeping their child at home, if he/she has any sign of illness. The school will contact parents if a child becomes ill during school hours. Once you receive such a call from the office or school nurse, we urge you to pick up your child immediately or make alternate arrangements. Any contagious illness should be reported to the school as a courtesy to other parents in the school. A doctor's note will be required before the child is readmitted to school. When a child shows evidence of a health problem, the parent will be called and advised. Emergencies: In the event of a medical emergency, we will attempt to reach you immediately. If a parent cannot be reached, the child will be taken to the nearest hospital and the child's physician will be notified. In such an event, we will also attempt to notify the individuals indicated by the parents on the Emergency Information Card. Due to the fact that some of our students suffer with peanut/tree nut allergies we have designated our school as a NUT AWARE school. We are asking all families not to send their children to school with lunches or snacks containing nuts or peanuts or have been prepared with nuts or peanuts. Our aim is to eliminate those foods that can cause allergic reactions in children. While we cannot guarantee a nut-free environment, we want to do all we can to make our school a safe place for those children with nut or peanut allergies. Please do not send any foods containing nuts or peanuts, such as peanut butter, Nutella sandwiches or health/energy bars, or granola bars with nuts to school with your child. Please always contact the classroom teachers before sending any food for sharing with the class for special celebrations such as Kabbalat Shabbat or birthdays. All food brought to school for a special event must be kosher and purchased in stores, commercially prepared and contain complete ingredients list. Home baked or home prepared foods are not allowed. All celebration foods must be shown to Miriam, the school nurse, so that it can be checked for compliance with our NUT AWARE policy. Please read all labels on packaged food to make sure it does not contain nuts, peanuts, traces of nuts or nut products and is not manufactured in a facility that processes nuts or peanuts. Please remind your children to wash their hands and face thoroughly before they leave home, especially if they have eaten nuts or peanuts or food containing nuts or peanuts prior to coming to school. We trust that you understand how deeply important it is to respect and adhere to these guidelines. We realize that our NUT AWARE policy is an inconvenience and may require added planning and effort on your part. However, the overall health of our children takes priority. There are many events for which children bring in food from home to share with their classmates. These include birthdays, parties, Kabbalat Shabbat and the like. It is important for these events to keep in mind the school Kashrut policy. Since every family adheres to different levels of Kashrut we do not distribute any food which was prepared in individual homes. All food shared in class events must be bought either from a recognized accepted kosher establishment, with a kosher label, or be a processed food item with an acceptable kosher certification. 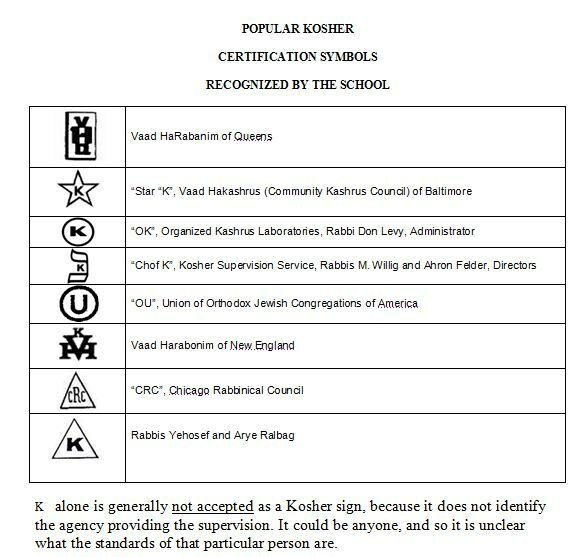 K alone is generally not accepted as a Kosher sign, because it does not tell who is the agency providing the supervision. It could be anyone, and so it is unclear what are the standards of that particular person. The school maintains a "Lost and Found" which is available for retrieval of lost belongings. Three times a year, prior to the school winter, spring and summer breaks, items left in the lost and found are sent to a homeless shelter. Try to retrieve lost items as soon as you know they are missing. We hope that parents would work with children to reinforce the habit of looking after one's possessions. By the end of the second marking period in the fifth grade, a student's academic and social progress will be assessed to determine if he/she is ready to meet the challenges of our Middle School. Sixth and seventh grade students who receive a failing grade in any academic subject (Judaic or General) at the end of a school year are required to attend summer school (where applicable), or complete an assignment over the summer given by the administration. 1. The assignment will be turned in prior to the first day of school and that the assignment must earn a minimum grade of 80. 2. The student will be required to maintain a minimum passing grade in all of his/her subjects. If at the end of the subsequent marking period the student has not maintained passing grades, the administration reserves the right to ask the child to leave the school. Any student who fails two or more subjects (secular or Judaic) at the end of the 8th grade will not be entitled to receive a diploma from the school. At times, some students may be required to obtain tutoring outside school. If for any reason you child is being tutored, it is important that you ask the tutor to contact the classroom teacher as soon as possible, and to maintain regular contact with the teacher. Teachers at the Solomon Schechter School of Queens may not be hired and salaried by parents for tutoring purposes, if that child in in attendance in that teacher's class. 1. Tefillah - All children take part in morning services. Younger students have services in their classrooms; upper grades meet in the lunchroom or gym. 2. Bar/Bat Mitzvah - Boys who are Bar Mitzvah are required to put on Tefillin and Taliit, daily. Girls are encouraged to wear Tefillin and Tallit also, but are not required to do so. 3. Kashrut - Children are to bring their own dairy lunches. The PTA also sells a dairy lunch. Regular whole milk and low fat milk are offered. Ice cream is sold during lunch hour for grades 1-8. Parents may enclose a mid-afternoon snack for students in grades K-2. NO HOME MADE FOOD IS ALLOWED FOR GROUP USE (PARTIES, CLASS TREATS, ETC.) PLEASE ADHERE TO THE LAWS OF KASHRUT WHEN SENDING FOOD TO SCHOOL. Parents who plan birthday parties which involve our students should adhere to the laws of Kashrut. Such parties should not be held on Shabbat or Jewish Holidays. We encourage that all children be invited. If this is not possible, invitations may not be distributed in school. 4. Kipport on students in school - All SSSQ we expect all male students and Jewish faculty, guests and parents to wear a kippah while at school. Please respect our culture by doing so. 5. Tzedakah - Tzedakah is collected every Friday. Parents are asked to encourage their children to perform this mitzvah of giving to the less fortunate. Reports are published periodically to list the recipients of Tzedakah and the amounts donated. Giving of charity is one of the core Jewish values we wish to instill in children. Students are expected to conduct themselves in an orderly fashion. To insure the safety and security for all inhabitants in the building, strict adherence to the required silence and order during an emergency and fire drills is an absolute necessity. All pupils must enter and leave the building under supervision. It is required of all students to exhibit respect and courtesy when responding to instructions from school staff. Students whose behavior interferes with their own progress or progress of others are subject to disciplinary action. Our confidence in our ability to provide a quality educational experience with reasonably few disruptions. This takes into account the capability of students and staff from a wide geographic area to arrive in a timely manner and return home safely. 1. Look at the website www.sssq.org A pop-up window will appear as soon as you visit the site. That message will remain displayed on the top of home page window until the end of the closure/delay. 2. An e-mail will be sent to you as soon as the decision is made. 3. Call 718-591-9800 and an automated voice message will inform you whether school is open, closed, or delayed. All school holidays are noted on the school calendar. When school is closed there is no one in the building to receive your child. For his or her safety, the school calendar should be retained and referred to concerning all monthly activities. Any changes or additions will be noted on the Thursday Notes. Our school day begins with Tefillah from 8:00 a.m. to 8:30 a.m. Classes begin at 8:30 a.m. with ten forty minute instructional periods. Dismissal is at 3:20 p.m. On short Fridays, the day is divided into nine thirty minute instructional periods, including a snack time, but not lunch period. Dismissal is at 1:20 p.m. (Check calendar for beginning and ending of early Friday dismissal). The school library is operated in conjunction with the instructional program in both Judaic and general studies. The goals of the programs are to familiarize the students with the workings of a library, to provide instruction as appropriate in library skills and, most importantly to foster a love of reading. Childern in grades 1-6 are scheduled for regular library periods. Students in grades 7-8 use the library on an as-needed basis. Classroom teachers assist the librarian and help students make appropriate selections of books for circulation. Books are loaned to students. Unreturned library books may result in postponement of promotion and issuance of report of report cards. Computers equipped with CD-ROM's and connected to teh Internet designed for research purposes and on-line communication are also available for the use of the students in our library. In addition, our library also servers as the media center for the school, housing AV equipment, filmstrips and videos. As part of our commitment to provide a safe learning environment, the following security policies and procedures will be followed. All visitors to our school will enter through the main 76th Road door only. Each visitor will sign in, provide photo identification, and obtain a visitor's badge from the security guard on duty before proceeding through the facilities. Badges are to be returned to the guard before leaving the building. The guard will record the time of arrival and the time of departure. Doors will remain locked at all times. In order to be entitled to join and continue membership on any athletic team sponsored by the school, a student must maintain a passing grade in all academic subjects and demonstrate satisfactory social behavior. The school is committed to maintaining at all times a learning and working environment free of sexual harassment and intimidation. Sexual harassment of or by any board member, parent, volunteer, administrator, faculty member, employee, student or guest is strictly prohibited. Students are expected to treat one another with dignity and respect. Sexual harassment is unacceptable. Sexual harassment is unwanted sexual attention that makes a person uncomfortable or causes problems in school, work, or in social settings. Some examples are verbal slurs or abuse; suggestive, offensive, or derogatory comments, sexist remarks about someone’s body, clothing, or sexual activity; insults of a sexual nature; request or demands for sexual favors; catcalls or other suggestive or insulting sounds or gestures; unnecessary and unwanted physical contact; and physical assault. Students who have complaints of sexual harassment should report them immediately to an administrator. Complaints will be considered confidential, and each complaint will be thoroughly investigated. If the evidence supports the allegation that sexual harassment has occurred, corrective action, including the possibility of suspension or dismissal, will be taken. 1. Assemblies: Assembly programs are presented to focus on special events, like Election Day, to commemorate various holidays both religious and secular such as Thanksgiving, Chanukah, Purim, Passover and the like, or simply to present topics of general interest to our students. Two special programs highlight the younger grades - Siddur celebration for first graders when they receive their first Siddur, and Chumash celebration for the second graders when they receive their first Chumash. Children are required to carry and maintain their personal effects in school. All items (i.e. notebooks, lunchboxes, textbooks and clothing) are to be clearly labeled with your child's name, and kept in an organized manner. Your child should come to school each day with the necessary supplies requested by the teacher; pencils paper, notebook, kippot, etc. Consult the supply list sent by each grade level teacher. Boys who do not have kippot will need to purchase them from the school office. The school administration cannot assume responsibility for personal property that is left behind in the gym, lunchroom, or schoolyard. It is unwise for students to bring to school large sums of money, expensive jewelry, equipment, cameras, tape recorders, computer games, coins, trading cards, stamps, stickers, etc. The school cannot assume responsibility for the safekeeping and care of such items. Backpacks which roll on wheels with extendable handles are not permitted in school. Prohibited items: Any weapon (actual or toy replica) is prohibited in school. MP3 players, electronic games and the like are not permitted in school. Cell phones may not be used in school at any time. Emergency calls will be handled by the office. Parents are asked not to make requests for their children to be placed with specific teachers or with special friends. At the end of each school year, class placement for the coming year is determined through collective input from the current classroom teachers, enrichment teachers, specialists and any other staff member who knows the child well. The administration thereby obtains a picture of the strengths and weaknesses of each student relative to his or her learning abilities as an individual and as part of a group. The goal is to create heterogeneous classes that are well balanced in terms of ability, gender and learning styles. Parents are asked to trust the school's ability to place each student judiciously. Student records are confidential and are kept in the school office with access limited to the professional staff members. A student's official record contains his/her test scores, health, attendance, and grade marks. In addition copies of reports made on admission to first grade, other reports, and communications between home and school, are included. Parents may receive information contained in the records, from an authorized professional staff member. The school has several specialists to provide additinal support and assistance to pupils. 1. School Psychologist: Our concern is not only with the academic success of our students but also with their emotional and general well being. The school psychologist may set up an appointment for a child upon the child's need to see her, or by teacher's referral. If necessary, the school psychologist may set up an appointment with the parents and/or make referrals to the appropriate facilities. All of the school psychologist's records are confidential and are never made part of the student's permanent record. 2. Academic support services are offered to students who require additional assistance in both Judaic and general studies. Messages from parents or relatives to students will not be accepted or transmitted unless it is an emergency. Children are not allowed to call home and we cannot interrupt the class to call students to the phone. It is the school policy to encourage class excursions to various sites in the city. Trips to museums, the Planetarium, Botanical Gardens, concerts, plays and operas all enhance the curriculum being taught in class. Younger children often visit important places and facilities in the neighborhood. The scope of our excursion program broadens in the upper grades with students spending extended periods of time at various sites related to their areas of study. Our sixth grade visits a science camp where they study ecology and its foundations in Judaism. Our seventh grade visits Washington, D.C., our nation's capital and Philadelphia, the site where our nation's independance was declared. They also visit the United States Holocaust Museum, providing them with an on-site experience ralted to their study of the Holocaust. In eighth grade our students culminate their elementary and middle school Judaics and Hebrew language with an excursion to Israel. Parental concent forms are required for each trip. Bus costs for most trips are covered by tuition. Special fees must be prepaid by parents. Food may not be purchased on trips. Lunches and snacks must be brought from home. All children must adhere to proper dress code and maintain proper decorum while particpating on any trip. nclement weather or unforeseen emergency may cause the administration to close the school. This decision will be made only as a last resort with the health and safety of students and staff as a primary consideration. This decision will be communicated to parents via a telephone relay set up by the PTA class parents. It will also be announced on our school's voice mail--should you call the school--and on WOR Radio Station 710 AM and WOR's School Closings Hot Line (877) 871-9208 along with other school closings. The Solomon Schechter School of Queens maintains a modern computer laboratory with high-speed access to the Internet. These facilities are intended solely to support the Jewish cultural and general academic needs of the school’s student body and faculty. Students, faculty and staff are expected to display proper computer etiquette at all times. This includes compliance with all copyright laws. Under no circumstances are our Internet resources to be used for solely personal matters such as sending and retrieving personal E-mail or accessing web sites for non-school related matters. The use of our computers to access the Internet outside of regular scheduled class time is only permitted with the approval and under the supervision of the computer teacher and/or school administrators.